American Friends of the CECI's Blog | CECI is dedicated to paving the way for a more stable and flourishing Israel through research and education. CECI’s initiatives focus on education of democracy and leadership programs. These initiatives empower Israeli citizens with a better understanding of their rights and obligations and encourage greater civic involvement in their communities to positively impact the future of the country. •	Ticket price will increase after midnight on August 22, based upon availability! Ticket price will increase after midnight on August 22, based upon availability! 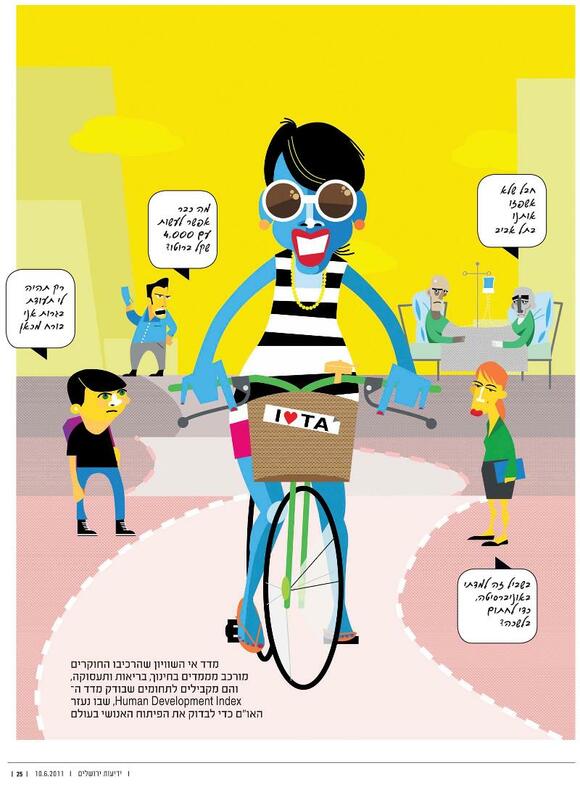 The “equality” on which Israel prides itself changes when one leaves Tel Aviv. 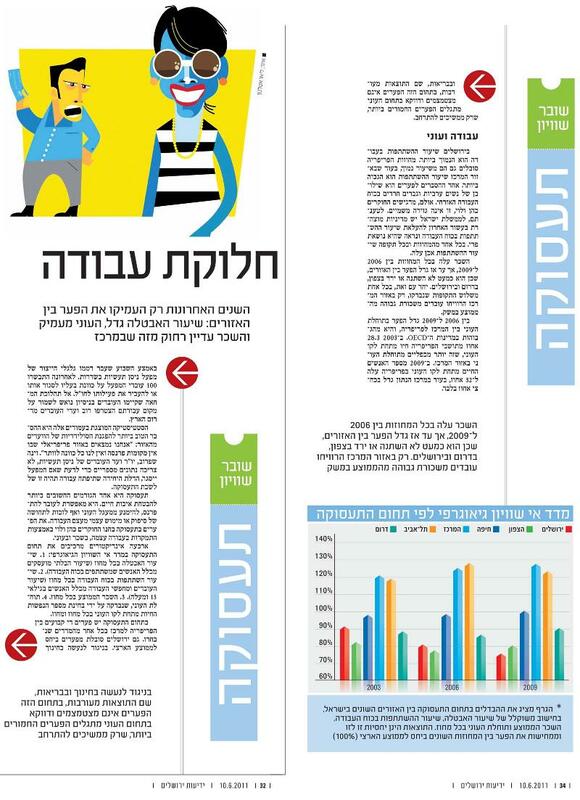 During the last decade, the gap in the quality of life between Tel Aviv and the “periphery” (North and South) has increased and reached abnormal proportions. 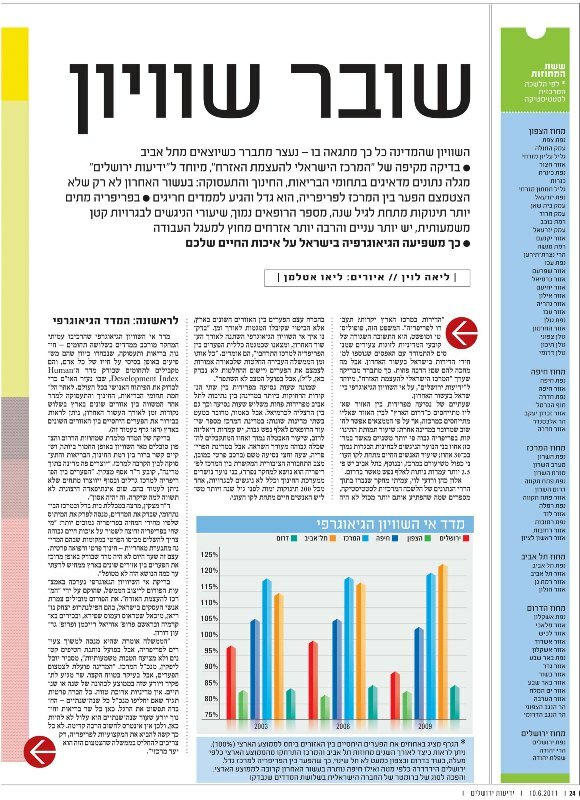 To address this issue, “The Forum for Government Stability”, spearheaded by The Citizens’ Empowerment Center in Israel (CECI), conducted research on the geographical inequality in Israel for Yediot Jerusalem. This special research revealed concerns in health, education and employment between the regions known as “North” and “South” Israel and the region known as the “center”, which is Tel Aviv. Based on research findings, we could think of this “periphery” in comparison to Tel Aviv as two different countries even though they are only 2 hours apart. Both the mortality rates and the percentage of infant mortality in the “periphery” are more than two times higher than in the “center”. The “center” also has more doctors, more dialysis stations, operations, and emergency medicine. In the “periphery”, there are fewer doctors and 1 out of 200 babies die before reaching their first birthday. The gaps in education between the “periphery” and the “center” are not as wide as in the health arena. However, the gap increases as the children grow older. Also, the percentage of youths in the “periphery” who participate in the matriculation exams is lower (about 30%) than in the “center”, as well as the number of students who receive university educations. In the “periphery”, salaries are lower. There is a higher unemployment rate than in the “center”, and one third of the people live below the poverty line, which is double the number of people living below the poverty line in the “center”. Dr. Matzkin, a lecturer at Beit Berl Academic College and the IDC, states, “It is correct that if the students from the “periphery” participate in the matriculation exams, the gap is small, but the more interesting question is — how many youths in each region participated in the exams; how many dropped out, and how many were told that they should not participate in the exams so they would not destroy the statistics? Those from both the “periphery” and the “center” who take the exams will pass it with similar scores, but the real question should be – what is the number of youths from each area, who started in a specific year, who will participate in the matriculation exams? This is the point we need to publish without being afraid, as it reveals the large gap between the “periphery” and the “center”. 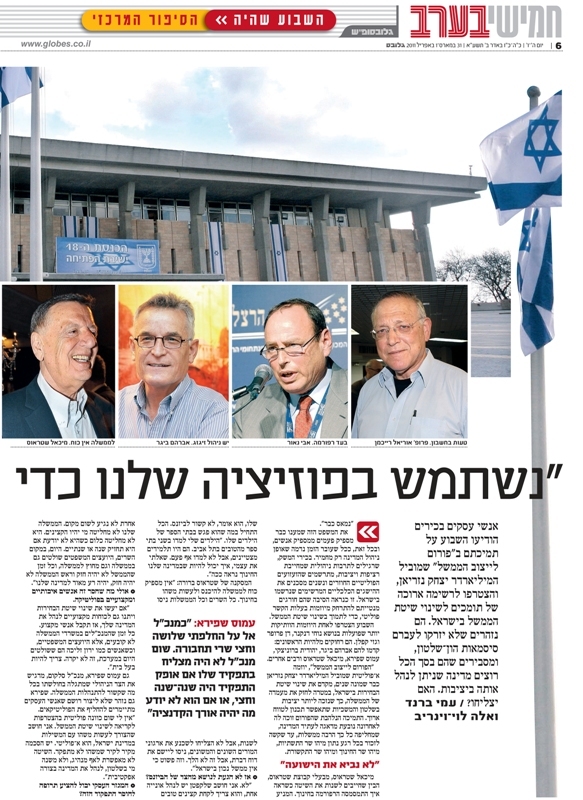 The Forum for Government Stability is lead by prominent businessmen from Israel; among them the philanthropist Izak Parviz Nazarian, Michael Strauss, Amos Shapira, and seniors from academia, including Professor Uriel Reichman and Gideon Doron. To learn more, contact American Friends of CECI at 310-300-4120. 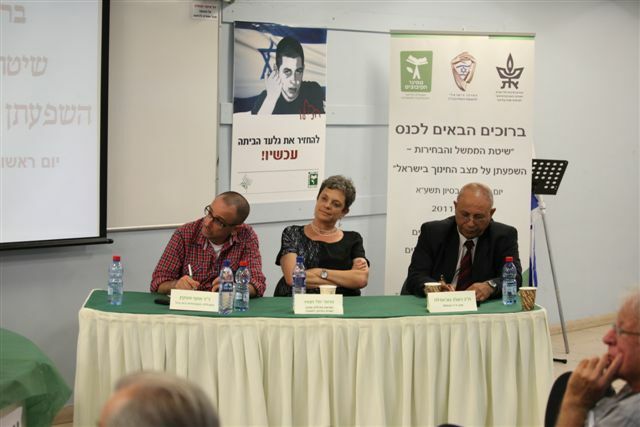 On June 5, 2011, CECI’s “Forum for Government Stability” and Tel Aviv University co-hosted a conference at Kibbutzim College of Education, Technology and Arts. During the meeting, MK Yisrael Katz, Minister of Transportation and the Chairman of the Governance Committee, called for a change for Israel’s electoral system. He argued that direct elections of the Prime Minister are not enough, and we need to combine a regional element in the system. This conference was a follow up of the May 25, 2011 meeting where Minister Katz addressed the Forum for Government Stability on topics that had been discussed by the Knesset’s Coalition Committee (established by Prime Minister Netanyahu in February). Minister Katz commented that the Coalition Committee recommends that the Prime Minister should be able to operate without constraints and the Ministers should be able to implement the policies they’ve decided upon. This would create a climate for a more powerful and stable government. He added that for some issues, such as raising the electoral threshold and the required number of MKs needed to dissolve the government when a “vote of confidence” is necessary, there is a possibility of getting a majority vote and a real chance for reform. This will contribute to a better functioning government system. The June 5th conference participants included prominent individuals from academia and the education field. Also present were Izak Parviz Nazarian (CECI founder), Uri Lubrani, and Uri Dori. Panel member Professor Nimrod Aloni, stated that politicians do not have an interest in having the public be well educated and astute. “Politicians prefer the public to follow them without asking questions.” Aloni proposed to create another authority — a “state education authority” which will determine the educational goals. CECI is addressing the connection between the lack of government stability and how it affects different aspects of life. CECI’s General Director, Yuval Lipkin, stated, “This conference is the first cooperation between CECI and the Kibbutzim College.” The goal of the conference was to discuss the connection between government stability and the challenges the education system has confronted during the last decade. 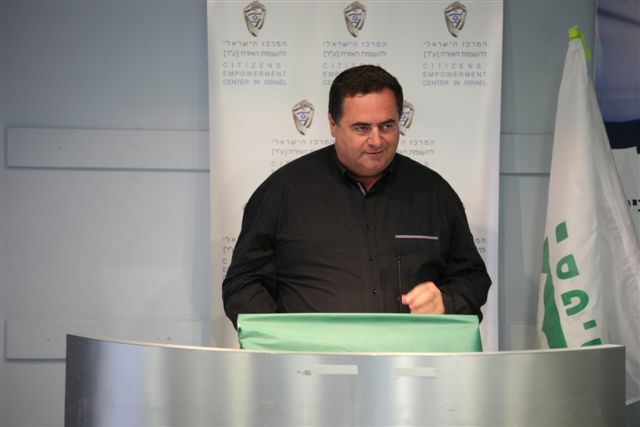 On May 26, 2011, The Citizens’ Empowerment Center in Israel (CECI) hosted a meeting with the Knesset’s Chairman of the Governance Committee, Minister Israel Katz, as well as Cabinet Secretary Zvi Hauzer, and members of “The Forum for Government Stability.” The Forum was established by CECI, an apolitical, non-profit organization founded by Izak Parviz Nazarian, which promotes education of democracy and leadership, government stability and good citizenship. Meeting participants included: Izak Parviz Nazarian, Michael Strauss, Amos Shapira, Ron Nachman, Galia Albin, Dan Halutz, MK Einat Wilf, and many others. Minister Katz briefed the Forum about the issues his Committee has discussed. These issues include: examining the presidential system, raising the electoral threshold (i.e. voter’s threshold), considering the head of the larger party to serve as Prime Minister, the definition of elected representatives vs. appointed ones, and the number of MKs needed to dissolve the government. Minister Katz stated that the Committee desires the Prime Minister to be able to operate without constraints and the Ministers to be able to implement the policies they’ve decided upon. This would create a climate for a more powerful and stable government. Katz contemplated that for some issues, such as raising the electoral threshhold and the required number of MKs needed to dissolve the government when a “vote of confidence” is necessary, there is a possibility to get a majority vote and thus a real chance to execute changes which will contribute to a better functioning government system. 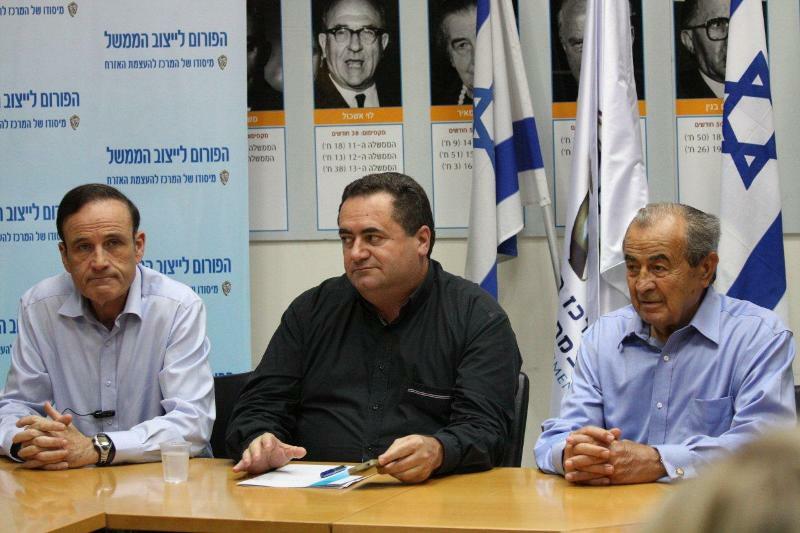 Izak Parviz Nazarian, President and Founder of CECI, voiced concern about Israel’s political instability, while expressing hope that the Knesset’s Governance Committee will help lead to a real transformation of the government and election system. Michael Strauss pointed out that the government system affects many areas of life. He gave an example of the educational system, which has undergone numerous reforms, but none have been implemented. Amos Shapira, Cellcom’s CEO, added that the problem is not the fault of the leaders, but of the system. If the government is not stabilized today, tomorrow will be too late. Ron Nachman, Ariel’s Mayor, introduced the Municipal Electoral System as stable and effective, and he added that local Authorities are the “operational arms” of the Executive Authority. He strongly recommended that the government adopt a similar system. “We are fed up!” is a sentence that has been heard many times from many Israelis. However, as time is passing, it seems that the management of the country is getting worse. Economic leaders, who are used to effective methods of management, require stability and continuity, and they believe that the chronic political upheavals are a danger to Israel’s impressive economic achievements. For that reason, unlike their usual tendency to stay away from politically connected initiatives, now they are supporting electoral and government changes. This past week, businessmen Nochi Dankner, Dan Propper and Gazi Kaplan have joined the long-standing Forum that is addressing finding alternatives to the current government system. The new members are uniting their efforts with veteran Forum members Avaraham Bigger, Yehudit Bronicki, Amos Shapira, Michael Strauss and many others. 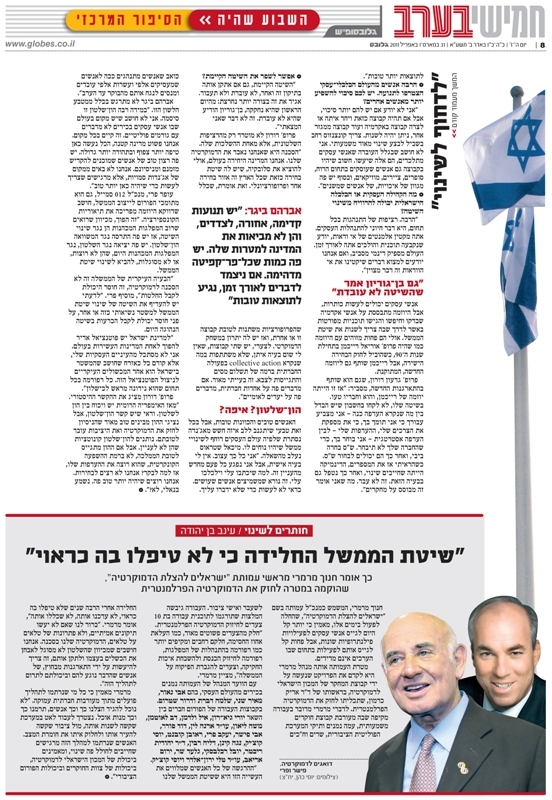 For the last 8 years, “The Forum for Government Stability in Israel” – a non-political initiative founded by Izak Nazarian – has been promoting electoral change to strengthen the government and achieve greater stability and continuity, in order to effectively implement long-term planning. Israel’s chronic government instability and concern for the future has prompted great enthusiasm within the Forum. The country has undergone so many changes that it’s hard to remember, at any given moment, the name of the Minister of Infrastructure, the Minister of Education, or the Minister of Communication. Amos Shapira, the Executive Director of Cellcom, emphasized that the current government management style is weak. 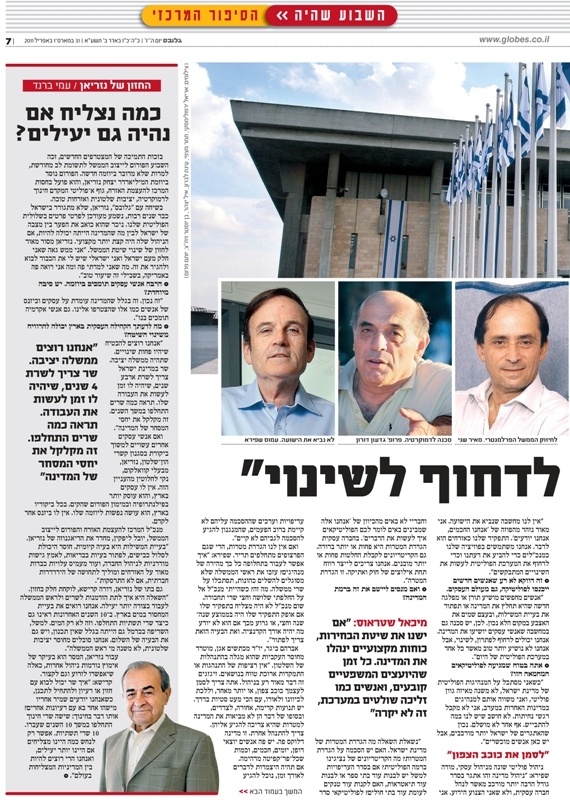 Shapira is cautious not to give the impression that businessmen want to replace politicians. “I have no political aspirations to join the movement to change the government system. I believe that the need to change the government is apolitical. There is wide agreement that something is not functioning. The current system does not allow any leader, no matter who is in power, to effectively manage the country. 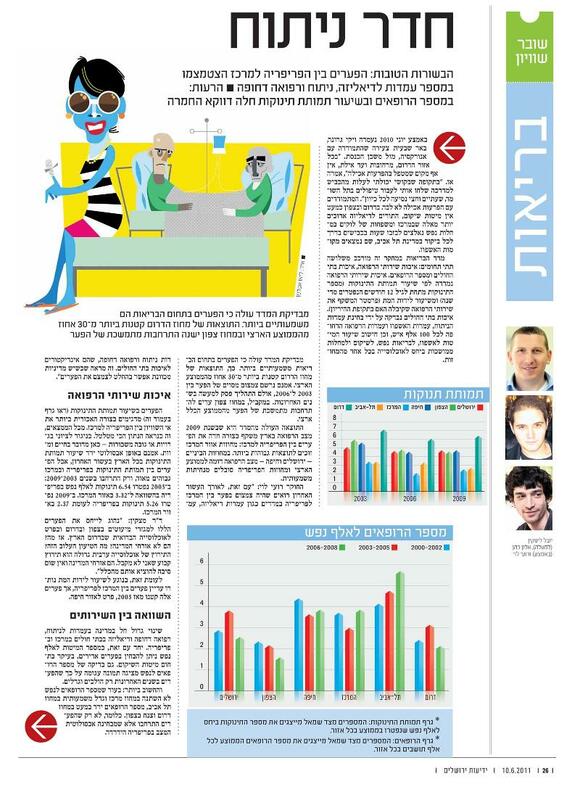 “The politicians change frequently,” Shapira added. “How can you work with such a rapid exchange of leaders? Don’t focus on the Prime Ministers who cannot finish their terms, look at the Ministers. Avraham Bigger is not concerned about this issue. “To a great extent, big business vs. government is just a phrase. I don’t think there is a place in the world, where senior businessmen don’t talk with political authorities. It happens in every country of the world. We are just a small country where everything is magnified. There are good-willed people who want to dedicate their time and experience. We don’t come from a place of hidden agendas, but we feel that we need to act so Israel will be a better place. This week, the Forum for Government Stability received renewed attention regarding its ongoing initiatives due to the support of newly joined economic leaders. The Forum was established by Izak Nazarian and spearheaded by his apolitical organization, The Citizens’ Empowerment Center in Israel (CECI) which promotes government stability and education of democracy, leadership, and good citizenship. How much more successful would we be, if we were managed more effectively? The Executive Director of CECI and the Forum for Government Stability, Yuval Lipkin, clearly defines Nazarian’s vision, “The governance problem is an existential problem. The lack of ability to build roads, to solve health problems, to adapt to modern approaches in company management, etc. heavily costs Israeli citizens and gives the impression that society is rapidly going downhill, if it has not already crashed. The daughter of Nazarian, Dora Kadisha, is also very active in Nazarian’s vision. “The question is how to enable the Ministers and Prime Minister to work more effectively. 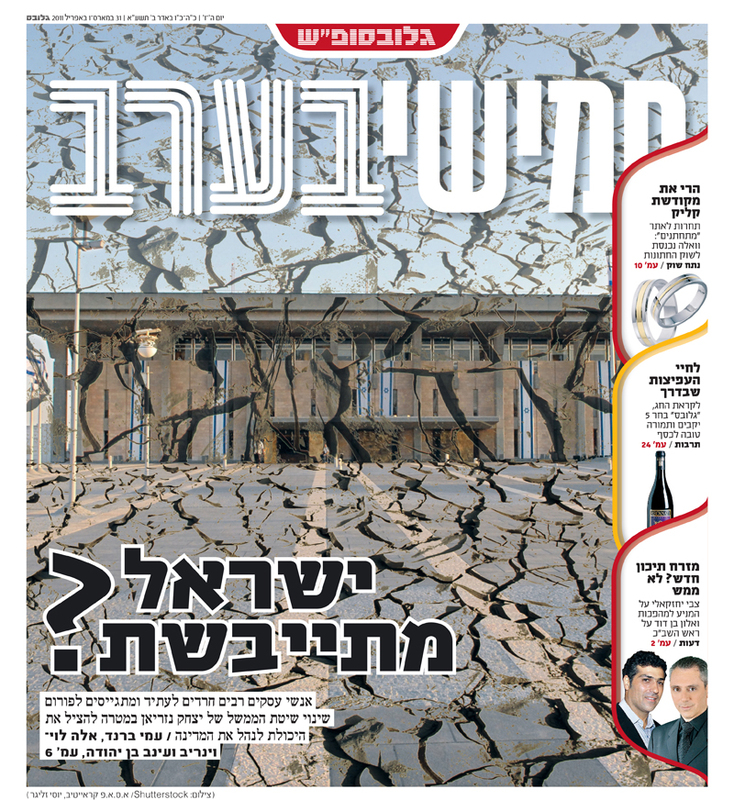 We see the problem in lack of planning for the water shortage in Israel, the Carmel fire, and peace initiatives, We suffer from lack of government stability no matter who is the Prime Minister”. American Friends of the CECI's Blog · CECI is dedicated to paving the way for a more stable and flourishing Israel through research and education. CECI’s initiatives focus on education of democracy and leadership programs. These initiatives empower Israeli citizens with a better understanding of their rights and obligations and encourage greater civic involvement in their communities to positively impact the future of the country.